Quality Hardwood Flooring Warehouse overstock items, special runs & discontinued products in stock at 30-70% Off. High quality hardwood flooring manufacturers: Mohawk, Shaw, Provenza, Kahrs and more. Oak, Cherry, Walnut, Hickory, Maple and the most popular Hardwood floor species in wide and narrow planks. We carry a variety of hardwood floor finishes to choose from: smooth, wire brushed, distressed & hand scraped. 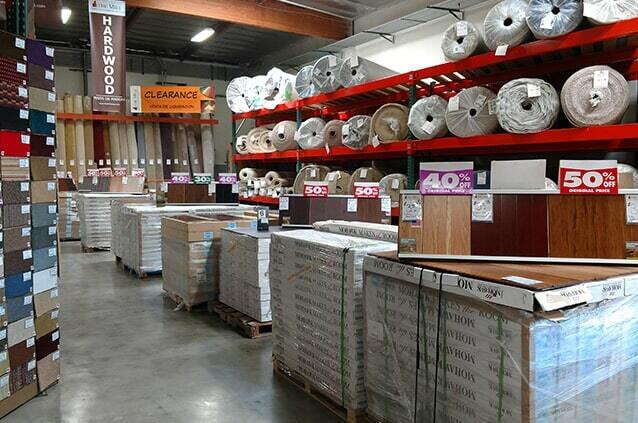 Over 1,000,000 square feet of quality flooring in stock: carpet, hardwood, laminate, vinyl, and transition moldings. There are many reasons why hardwood flooring continues to be so popular. The first is that it can last a lifetime and can be refinished to change the stain color and finish. There are two main types of hardwood construction– solid and engineered. At The Mill Carpet & Flooring Outlet, we know that our customers are looking for these incredible flooring systems and we have them for you. Hardwood flooring can be manufactured as a solid piece of wood or what is known as an engineered hardwood. Prefinished hardwood flooring is stained and finished by the manufacturer and ready to be installed. Solid hardwood flooring can be more expensive than engineered but can be sanded and refinished several times over its lifespan which can last generations. Engineered hardwood is real hardwood and starts out with strong, long-lasting cores of plywood, HDF, or hardwood. Atop this core, a true hardwood wear layer is adhered; this hardwood wear layer can also be refinished to change the color and finish depending on the thickness. Why Choose Engineered Hardwood Over Solid Hardwood? Solid hardwood flooring cannot be installed under certain conditions such as where moisture or heat is present. Solid hardwood should not be installed below ground level. These issues are not a problem with engineered hardwood flooring. Engineered hardwood can be installed just about anywhere and it usually costs less, too. Engineered hardwood flooring is by far more versatile and more stable than solid hardwood and is more resistant to humidity and moisture. Most engineered hardwood flooring can be installed in basements, below grade and it is also less prone to buckling or cupping, both of which can be an issue with solid hardwood. It can also be glued down to the sub-floor. As with solid hardwood, engineered hardwood flooring can be sanded and refinished to change the color and finish. Keep in mind hardwood flooring can be screened (lightly abraded) and the finish can be reapplied an unlimited amount of times to bring the floor back to its’ like-new condition. Hardwood floors are easy to clean and maintain and with proper care can last for decades.